Many student athletes chose UC Berkeley because of its academics, and now that the university has killed their sports, they're leaving, too. 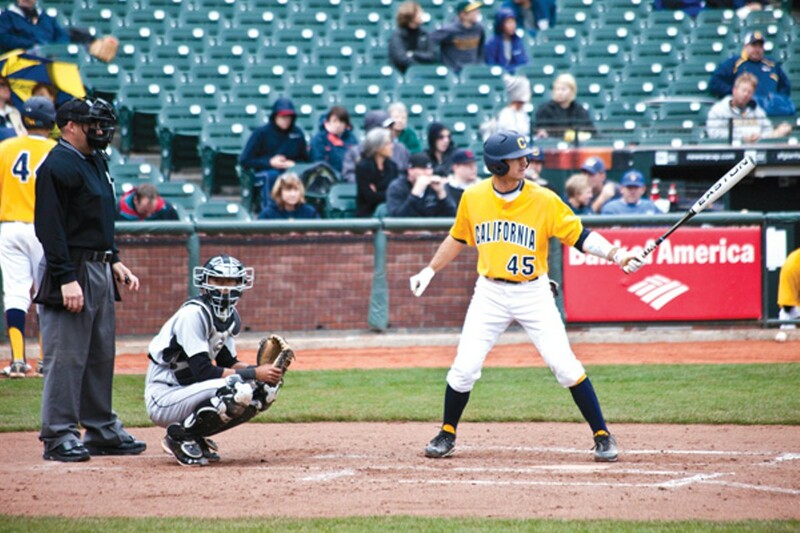 Chad Bunting (45) is a math major who says playing for Cal baseball has been "amazing." Erik Johnson looks like the stereotypical jock. He's big, burly, and overpowering on the pitching mound. And with a strong fastball, a deceptive changeup, and a nifty curve, Johnson was recruited by a lot of the big-time baseball schools, from Arizona State to Long Beach State. But when decision day came, Berkeley was a no-brainer, so to speak. "Academically," Johnson explained, "Cal just blew every other school out of the water." That's also why fellow pitcher Dixon Anderson, who grew up in nearby Piedmont, chose Cal. Academics, in fact, convinced him to remain at Berkeley as well. Last summer, he turned down an opportunity to play pro ball in the Baltimore Orioles organization. "Giving up the chance to complete my degree here at Cal for anything other than the perfect, perfect opportunity would have been a poor decision," he explained. "You're going to need a career and a life post-baseball." But now that UC Berkeley has eliminated baseball and men's gymnastics in a cost-cutting move, the odds that Cal will attract scholar-athletes like Johnson and Anderson have lessened. In fact, Cal baseball officials expect that all 22 of the team's freshmen and sophomores will try to transfer to other schools after the Golden Bears' final season at Evans Diamond ends this June. The loss of baseball at Cal also means a loss of academic opportunities for students who may not otherwise he able to attend Berkeley. "Who knows what I would have done after high school if I didn't play baseball," said former Bear Mike Tonis. "I might have just worked for my dad to make some money." Tonis quit school after he was drafted by the Kansas City Royals as a junior in 2000. But after three elbow surgeries, a shoulder surgery, and a knee injury, his playing days were over by 2007. He spent a total of one week in the big leagues and never regrets chasing that dream. But because he was a scholarship athlete, he re-enrolled at Cal, where he'll become the first member of his immediate family to earn a bachelor's degree this December. "I always had that option to come back and finish," he noted. Few Cal ballplayers crack the team's starting lineup on a regular basis and only a small fraction of the school's nine hundred student athletes ever get a sniff of professional-league play. They're students trying to earn degrees from an elite school, just like everyone else on campus. That's why manager David Esquer uses Berkeley's academic reputation as a recruitment tool: "A school like Cal attracts kids who are looking for something beyond baseball," he noted. The stereotype that all athletes are just dumb jocks doesn't hold at UC Berkeley. As a whole, Cal's student athletes carry a highly-respectable 3.0 GPA, and for baseball players, it's 2.8 — not far below the campus-wide 3.3 average. Esquer said that in his twelve years at the helm, not one baseball player has missed a single game due to academic ineligibility and everyone who has played a full four years has graduated. While some have left school early to enter the Major League Baseball draft, he said more than half of them have returned to finish their degrees. "The idea that these student athletes are somehow debasing the academic integrity of the university is just not true," said Derek Van Rheenen, a former Cal athlete and Ph.D, who runs the Athletic Study Center and has authored several books, including Academic Motivation and the Student Athlete and When Scholarship Athletes Become Academic Scholars. The academic records of ballplayers are even more impressive considering that athletic training is a full-time job. The stereotype may be that college athletes are coddled through school, but in reality, most lead intensely hectic lives. Take the average day of a baseball player: In the fall he's in the weight room early, often before sunrise, for about two hours. Then he goes to class. By early afternoon, he's out on the diamond practicing for another four or five hours. Weekends are for scrimmages; he studies when he finds time. "I've definitely spent numerous late nights in the Moffitt Library," said Johnson, who carries a 3.5 GPA. In spring, the team plays four games a week, often traveling across the country. "A vast majority of the students on campus can have a singleness of focus," noted former ballplayer Sam Petke, a first baseman from 1997 to 2000. "It takes incredible time management to compete academically and athletically at the highest level." Anderson said he'll likely play pro ball somewhere next year since he can graduate this May. Like every ballplayer, he hopes to play for twenty years, earn millions and get a plaque in Cooperstown, but he expects to be back in the classroom when he eventually hangs up the cleats. "A graduate degree is probably the next step after baseball," he said. Johnson, meanwhile, will probably skip his senior year for the draft rather than transfer to another school. Although he regrets that he won't be able to finish four years of college sports at Berkeley, he said the elimination of baseball won't end his education. "One of my goals is to get that Cal degree," he said. "I do not see myself not graduating from the University of California, Berkeley." Although the Johnsons and Andersons will always have a place to play college ball, it's the Chad Buntings of the world who will miss out on the chance to participate in big-time sports while at Berkeley. Any student at Cal can try out for baseball; the team has roster space for ten to twelve walk-ons who fill up the end of the bench. Four years ago, Bunting, a math major from Ukiah, took a shot at making the team. "He was a bullpen catcher with no future of playing," Esquer said. "He was not thought of as a kid who would ever be productive and help us on the field." But Bunting wasn't satisfied with that role, so he came to practice early, stayed late, took extra reps in the cage, and picked the brains of his teammates. Sure enough, Esquer penciled him into the lineup one day and he seized the moment by cracking a homer. Now, he's a starting outfielder. "It's been amazing," Bunting said. "You learn more about life out here. The brothers you make, the family you get to be a part of — it's enriched my life a ton. It's more than you could get from school alone." Bunting will graduate this spring with a year of baseball eligibility left; he'll try his hand at the draft this June and likely transfer if there are no takers. None of this would have been possible without Cal baseball. "What's lost is opportunity," Esquer said. "The 100 percent scholarship player, he loses his opportunity to come to Cal and do both. And the long shot — the Chad Bunting story — doesn't happen often, but it doesn't ever happen if the program isn't here." Yet despite the university's decision to eliminate the program, Cal baseball isn't giving up. As of earlier this week, the team was off to a strong start (12-5) and the players plan to show what they're worth with a run at the College World Series this June. Then, maybe, someone with deep pockets will step up to the plate and save the team in the bottom of the ninth. It's unlikely, but baseball is all about hopes and dreams.